My father, who owned and operated a tour company in Casablanca, Morocco and France for many years, took me along with a group of German tourists to visit a traditional "Wedding Fair" at Hadiddou Imilchil, a Berber village in southern Morocco. 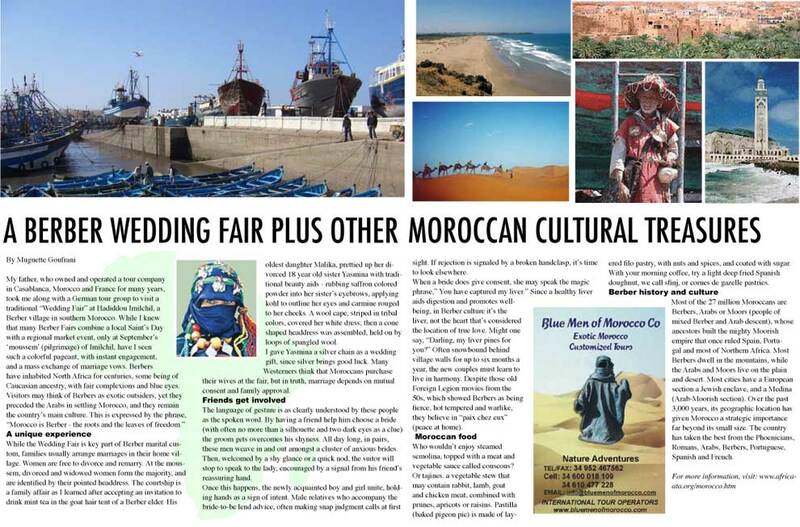 While I knew that many Berber Fairs combine a local Saint's Day with a regional market event, only at September's 'moussem' (pilgrimage) of Imilchil, have I seen such a colorful pageant, with instant engagement, and a mass exchange of marriage vows. Berbers have inhabited North Africa for centuries, some being of Caucasian ancestry, with fair complexions and blue eyes. Visitors may think of Berbers as exotic outsiders, yet they preceded the Arabs in settling Morocco, and they remain the country's main culture. This is expressed by the phrase, "Morocco is Berber - the roots and the leaves of freedom." While the Wedding Fair is key part of Berber marital custom, families usually arrange marriages in their home village. Women are free to divorce and remarry. At the moussem, divorced and widowed women form the majority, and are identified by their pointed headdress. The courtship is a family affair as I learned after accepting an invitation to drink mint tea in the goat hair tent of a Berber elder. His oldest daughter Malika, prettied up her divorced 18 year old sister Yasmina with traditional beauty aids - rubbing saffron colored powder into her sister's eyebrows, applying kohl to outline her eyes and carmine rouged to her cheeks. A wool cape, striped in tribal colors, covered her white dress; then a cone shaped headdress was assembled, held on by loops of spangled wool. I gave Yasmina a silver chain as a wedding gift, since silver brings good luck. Many Westerners think that Moroccans purchase their wives at the fair, but in truth, marriage depends on mutual consent and family approval. The language of gesture is as clearly understood by these people as the spoken word. By having a friend help him choose a bride (with often no more than a silhouette and two dark eyes as a clue) the groom gets overcomes his shyness. All day long, in pairs, these men weave in and out amongst a cluster of anxious brides. Then, welcomed by a shy glance or a quick nod, the suitor will stop to speak to the lady, encouraged by a signal from his friend's reassuring hand. Once this happens, the newly acquainted boy and girl unite, holding hands as a sign of intent. Male relatives who accompany the bride-to-be lend advice, often making snap judgment calls at first sight. If rejection is signaled by a broken handclasp, it's time to look elsewhere. When a bride does give consent, she may speak the magic phrase," You have captured my liver." Since a healthy liver aids digestion and promotes well-being, in Berber culture it's the liver, not the heart that's considered the location of true love. Might one say, "Darling, my liver pines for you?" Often snowbound behind village walls for up to six months a year, the new couples must learn to live in harmony. Despite those old Foreign Legion movies from the 50s, which showed Berbers as being fierce, hot tempered and warlike, they believe in "paix chez eux" (peace at home). Who wouldn't enjoy steamed semolina, topped with a meat and vegetable sauce called couscous? Or tajines, a vegetable stew that contains rabbit, lamb, goat or chicken meat, combined with prunes, apricots or raisins. Pastilla (baked pigeon pie) is made of layered filo pastry, with nuts and spices, and coated with sugar. With your morning coffee, try a light deep fried Spanish doughnut, we call sfinj, or cornes de gazelle pastries. Most of the 27 million Moroccans are Berbers, Arabs or Moors (people of mixed Berber and Arab descent), whose ancestors built the mighty Moorish empire that once ruled Spain, Portugal and most of Northern Africa. Most Berbers dwell in the mountains, while the Arabs and Moors live on the plain and desert. Most cities have a European section a Jewish enclave, and a Medina (Arab-Moorish section). Over the past 3,000 years, its geographic location has given Morocco a strategic importance far beyond its small size. The country has taken the best from the Phoenicians, Romans, Arabs, Berbers, Portuguese, Spanish and French.